New Jeep parts do not have to be expensive, or difficult to buy. 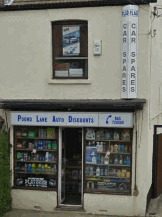 Before you think of going to the Jeep main dealers for the part you are looking for come to Car Spares Essex. We have a huge range of Jeep spares for all models sitting waiting on our shelves. And when we say all models we really mean all, as we can go back to the earliest of Jeep makes and models. Yes, I’m sure you think that we are simply talking about Jeep parts for Cherokee and Grand Cherokee, and the type of the models that you currently see driving around Essex and the UK. But we have water pumps for Jeep Compass, Distributor caps for Jeep Patriots, and a wide range of other parts all in stock. Just Some Of The Jeeps We Can Get Spares For! These are just a few of the Jeeps that we can supply parts and supplies for. Although this is an extensive list, it is not exhaustive and if your vehicle isn't listed below we can still make an effort at finding the Jeep parts that you are looking for. At the bottom of the page you will find the full list of Jeep Parts that we can supply here are Pound Lane Auto Discounts In Essex. Right It Sounds Great, So How Can I Buy My Jeep parts From You Then? And if you are too busy to make the call, or we are busy….and sometimes man those phones don’t stop ringing, you can email your order and request for your Jeep part through to us that way too. What Do You Do If You Don’t Have The Jeep Parts I Want? So if we don't have the Jeep motor spares you want, exactly the same as all other models of vehicles that we can cater for, if we haven’t got the part at the time of your visit which is unlikely, we will do everything we can to get it for you. With a history in the industry stretching back over 25 years, we are in contact with all the Jeep breakers, or manufactures that can supply us as a priority. However I guess it if fair to say that sometimes we just won’t be able to help provide your Jeep parts and its not something we have or can get. But that shouldn’t be a problem either as we have been around the Jeep parts and spares world for over 30 years, and so we can tell you where to go and get it. You may not be our customer the first time you contact us, or the second, but we will do our best to make sure when you need some Jeep parts you at least think of Car Spares Essex aka Pound Lane Auto Discount first. So wherever you are in the county or further afield…..and we are constantly amazed and grateful as to how far people drive to get their Jeep spares from us, it won’t take you long. And due to the fact as we said previously you can order the parts for your Jeep ready for collection, using us will probably save you time in the long run.